Finished the baby socks. As you can see they are definitely not matchy matchy ;P, but close enough that you can tell they are a set. I used Knit Picks Options double pointed needles size 0, and the yarn was Premier Wool-Free Sock yarn in the Vegas Lights colorway. They were well loved. Anyone know if they make baby sock blockers? I bought some yarn for a Chemo hat for a friend who is dealing with breast cancer. I went to Hobby Lobby and chose Yarn Bee Snuggle Up in the silver colorway and Yarn Bee Cloud 9 in the cream colorway, Hobby Lobby had a sale on their yarn and I like their yarn :). They are both soft yarns and together they are extremely soft. 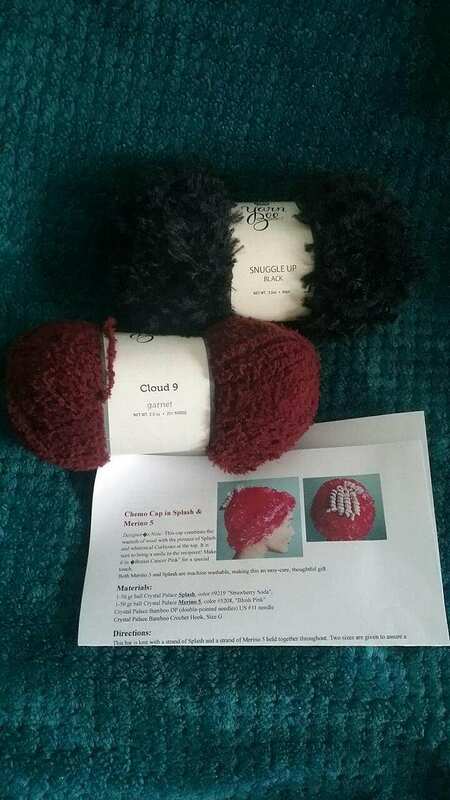 There is another hat pattern I want to knit and the designer said she will put it back up on Ravelry. I will post more about it when it’s up. Raverly is such a wonderful knitting community where we all share our love of knitting, crocheting, spinning and other fibery creativeness. This pattern I used is a Lion Brand Yarn free pattern called Fun-Fur – Mircospun Knit Chemo Cap. I used a size 10 bamboo 16″circular needle and a set of size 10 double pointed needles when I got to the crown. I bit the bullet and bought a set of bamboo Addi Flexi-Flips size 0’s to knit socks with and they came in the mail today (my local yarn shop didn’t carry them.) Altho’ I enjoy knitting the socks, I hate the using the regular double pointed needles and I never learned to knit using the magic loop method. These are kinda like a combination of those methods and I thought I would give it a try. They are a bit pricey at $32 dollars a set. There are 3 needles in the set with a flexible cord that bends so that you can knit small radius round items items like socks. 🙂 Hopefully I will enjoy this method much better. A friend of mine passed away a couple of months ago and her husband said she had asked that I be given her spinning wheel and all her fiber. I wasn’t sure what kind of wheel it was and when I received it today I had to put some of it back together, but it is a Kromski Polonaise. It’s a beautiful Mahogany finished wheel and will look much nicer when I get it cleaned up from all the dust that has taken up residence on it, I honestly don’t know that she ever spun on it but she loved fibery things. I will figure out more about it and add it to my wheel collection and spin on it. This one appears to be able to be used as a double band drive or a scotch tension. There was a number (wheel number?) date and signature on the bottom, will have to investigate that. The band was not on the wheel so I will try to figure out making it work as a scotch tension, but I can say the wheel moves very freely, I have a feeling this will be a really nice wheel to spin on. Hehe , I think my Rick Reeves wheel is a little jealous, you can see it in the back ground doing a photo bomb :). My project was my Little Lace Cat’s Paw Scarf design with my hand spun yarn. I’ve knit this little scarf several times and still enjoy it. The colors on the scarf are blown out, it really is a medium teal color instead of the lighter color that shows. I am working on spinning on my Rick Reeves spinning wheel, but the tension is a bit finicky (it’s a double band drive tensioned wheel and I’m use to scotch tension). I won’t give up, I’ll get it eventually, it’s the only wheel I have at the moment that does not need some repairs, so learn on it I must :P. I’ve got quite a bit of practice fiber, so I will keep working on it and save my nice fiber for after I have the learning curve down :). Our weather has gotten much better, rain instead of snow and we have been in the 30’s, 40’s, and today and tomorrow lower 50’s!! WOOT Spring is almost here, we will be back in the 30’s and 40’s after today. I say almost because we can still get snow through April. But I will be keeping an eye open now for the Robins, who are my true signal that Spring is finally here :). I love Spring! Yep, They Stole My Hour Yet Again!